If you’re involved in primary education, you will have realised Seesaw has been taking the educational world by storm over the last few years. Seesaw is an exciting tool! However, I’ve always believed that just because others are using something, doesn’t mean it’s right for your students; it’s important to keep in mind the purpose of your tech tool. This post will help you evaluate whether Seesaw is something that’s worth using in your classroom. Or, if blogging with WordPress is a better option to replace or complement Seesaw. Disclaimer: While I now work Edublogs as a community manager, this post is 100% my own thoughts and not associated with Edublogs. I taught and used blogs for 10+ years before combining teaching with Edublogs work. This post evolved as I researched and worked through my thoughts on the changing landscape of digital portfolios. Seesaw is a digital portfolio tool where students can document and share their learning using photos, videos, drawings, text, PDFs, and links. Student work is compiled in one place and shared with teachers and families. Seesaw can be accessed via the web or iOS/Android apps. Why is Seesaw so popular? It solves a lot of problems for teachers, schools, and families. Over recent years, it’s become a lot more commonplace for classrooms to be equipped with digital devices — whether that’s iPads, Chromebooks, or other computers. This is great news! Teachers understandably want to make the most of these devices and use them for creating, learning, communicating, as well as documenting learning — both analogue and digital. A simple tool is needed to document and share learning. Seesaw does this really well. Parents love to see what students are working on in the classroom and anything that helps build the home-school relationship is going to be worthwhile. Another positive of Seesaw? There are built-in translation tools which can make this really accessible for all families. Busy teachers can also use Seesaw to document and track student work. In turn, they hopefully will be able to better cater for their needs and scaffold their learning. Additionally, teachers can easily differentiate tasks and cater for all students at their point of need. There are lots of learning activities available on Seesaw but it’s not a standalone tools. Seesaw integrates with lots of apps as well as Google Drive. Students with special needs or learning difficulties can particularly benefit from Seesaw. Having the option to demonstrate learning in a variety of ways (speaking, drawing, video etc.) is definitely a good thing. The simplicity of Seesaw is a big drawcard. Any teacher who has taught junior grades knows it can be hard enough to get all students simply logged on to a device and achieving the outcome for the lesson. They don’t need the added complexity of intricate tools and applications. With Seesaw there are no worries about the dreaded login process as students can simply scan QR codes. Seesaw is intuitive for children and adults alike with (minimal) big buttons and familiar icons. The focus is on learning, creating, sharing, and documenting, rather than understanding or troubleshooting the technology itself. Seesaw is free to use with paid options for Seesaw Plus ($120/year) and Seesaw for Schools (price varies). The option of using a free account is a relief for stretched school budgets! However, if you want the students to keep their journals from year to year or class to class, which is really ideal, you need the paid Seesaw for Schools option. As Matt Renwick says, it’s not really a digital portfolio if students’ work disappears at the end of the school year. Students and teachers can’t look back, assess, and improve. Another advantage of Seesaw is the enormous worldwide community attached to the platform. It’s easy for teachers to connect and learn with other Seesaw users through Facebook groups, webinars (PD in your PJs), Twitter, Instagram etc. Educators who use Seesaw are invited to complete an annual training course to become a Seesaw Ambassador. In return, they’re expected to be an “expert resource” for other teachers in their school and district. Apart from the status of displaying your Ambassador badge online, one of the main perks of becoming an Ambassador is having access to the Seesaw Plus premium features for free. In some ways, the large community of Seesaw users and fans does the bulk of the marketing for the company. In fact, a 2018 article reported that 1 in 2 schools in the US is using Seesaw. 50%! But just because it’s so popular, does that mean you should be using Seesaw too? Maybe. Maybe not. There can be two-way communication with families; translation tools helps with language barriers. There are a plethora of activities for students to work on and students can be creative and collaborative in their responses. Seesaw integrates with many popular apps and web tools, as well as Google Drive which is commonplace in many schools. Teachers can cater for students’ individual needs, differentiate, and build on their progress. Seesaw is simple and intuitive for teachers, students, and parents to use. There’s a minimal learning curve. There are different pricing options — Seesaw is free to get started. Seesaw Plus is $120/year per teacher. There’s a large worldwide community that supports ongoing learning and sharing of ideas. In the first few years of primary school, I certainly think it’s a good idea to use an intuitive simple tool for documenting learning. As we discussed, Seesaw is easy to use from a technology perspective. Students can focus on their learning goals and basic skills like taking good photographs, speaking clearly, recording a quality video and so on. This sets them in good stead for the future. But what is that future? Year after year after year of using simple functions in a controlled environment with a small audience? Being a teacher is like juggling 100 different balls in the air at one time. So I know how tempting it is to want to keep the tech side of things under control. Having minimal buttons and options for students might make things “easier” to manage but is this best for students? Are they fulfilling their potential? Is “easy” best? Every maker of video games knows something that the makers of curriculum don’t seem to understand. You’ll never see a video game being advertised as being easy. Kids who do not like school will tell you it’s not because it’s too hard. It’s because it’s–boring. Common Sense Media tells us that children are accessing devices at a younger age than ever. Learning to become a digitally literate global citizen requires experience with all aspects of our digital world — not just “made-for-school” platforms. Furthermore, even young students may have more skills than you think, if given the opportunity to expand on them. I wonder if after a few years of consolidating the basics with a “made-for-school” tool like Seesaw it’s time to move on? 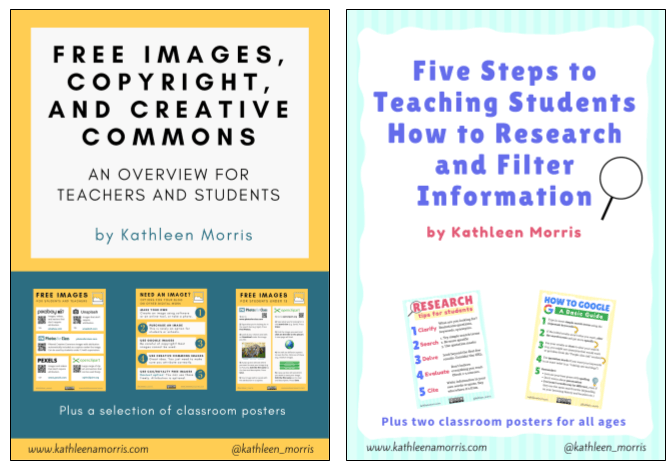 Okay, you might think I’m biased after being an educational blogger for 10+ years. And remember, I now do some work for Edublogs, although this post is 100% my own thoughts and not part of any paid work. Let’s look at the advantage of using a blog as a digital portfolio. What do I mean by blogging? I mean preferably using a WordPress based platform (WordPress.com, self-hosted WordPress.org, Edublogs, or CampusPress). WordPress is the #1 choice for most professional bloggers and in fact WordPress powers over one-third of the whole web. It’s a “real” tool. So why wouldn’t we want our students gaining experience with this software? Read more about why I think WordPress is the best choice for student bloggers in this post I wrote for The Edublogger. With Seesaw there is only so much you can do. You can keep making videos, voice-overs, photos and so on but this isn’t going to help students either meet curriculum goals or develop essential “real-world” skills. 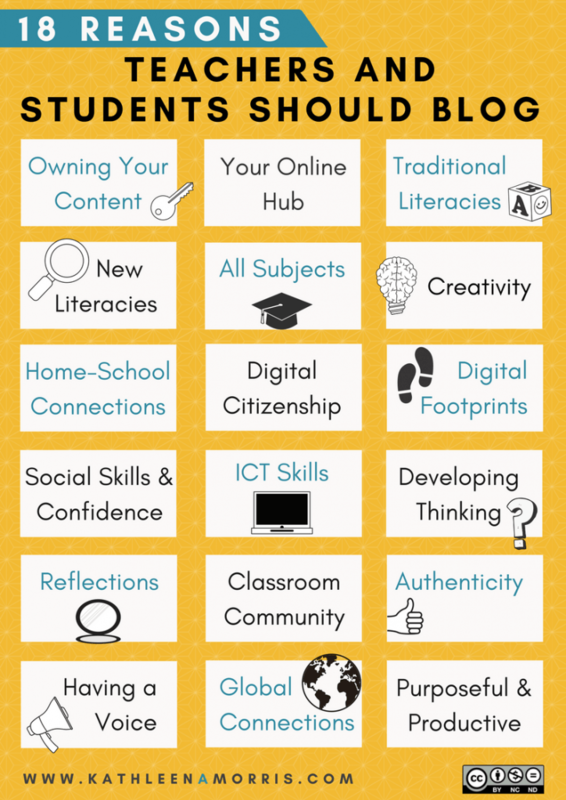 With blogging there are so many directions you can explore: digital citizenship, designing, coding, integrating a range of web tools, communicating with a global audience, managing your own online space, and navigating all sorts of digital dilemmas. Blogging also allows students to develop important new literacy skills; digital reading and writing skills that are not linear like the traditional model. Digital literacy includes things like hyperlinked writing and producing content that draws in a variety of sources and connects the dots. Read more about the benefits in my post, Why Teachers And Students Should Blog: 18 Benefits of Educational Blogging. As Seth Godin says, we need to “connect the dots” rather than “collect the dots”. That is, rather than memorising information, students must be able to learn how to solve new problems, see patterns, and combine multiple perspectives. All of this is a natural part of the blogging process. Yes, Seesaw has a “blog” component and claims that you can connect with a global audience but this feature is limited. Wouldn’t it be nice if students could start building a digital portfolio that actually means something? A portfolio that they can use to market themselves and demonstrate their learning as they progress through their school and graduate? UK principal Ross Cooper echoes these thoughts in his article “Digital Portfolios and Blogs: Use Authentic Technology, Not Technology Made for School”. Teaching digital citizenship is a non-negotiable (yes). And authentic platforms allow students to learn about navigating the web safely with supervision and guidance. Teaching entrepreneurship is quickly becoming a non-negotiable and students need to know how to share and market their work to an authentic audience. The resumé is dead, or dying and students need to build their online presence on a website that will actually show up in a Google search. Let’s also talk about an issue I see happening with super easy tools like Seesaw: they can become a digital dump. It’s so easy to upload multiple work samples every day with little thought. Over time, you end up with a lot of content without much organisation, reflection, or purpose. This is something you need to be wary of when using digital portfolios. Of course there are ways around this. For example, you can use folders to organise content with Seesaw and regularly delete content you don’t want/need. Students can learn to organise their folders — it’s a very important life skill to learn how to keep your digital life well-organised. This is a great starting point. Blogs can become digital dumps too but because there are a few more steps involved in publishing something, it might not happen quite as much. Many schools are looking at ways that they can embrace different types of “portfolio” programs, yet many of them are hidden from anyone other than the school community and parents at home. They do nothing in helping with developing a child’s digital footprint, and become in some ways a “digital dump”. This is why I am such a big advocate of using blogs as digital portfolios, knowing that they are not limited in mediums, but can prove to be useful after a child’s time in school, while helping to build a positive footprint, while also being easily transferable. 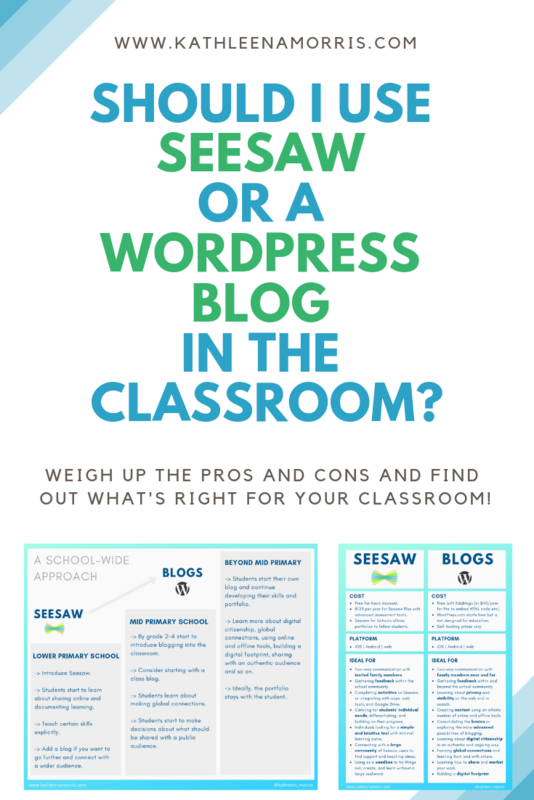 We’ve weighed up some pros and cons of blogs and Seesaw. Now what? Perhaps it’s not an either/or situation. 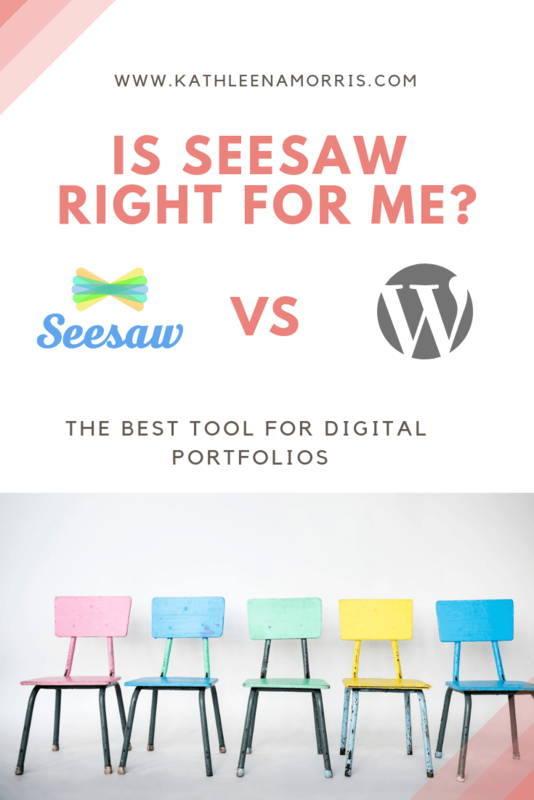 Perhaps you can enjoy the benefits of Seesaw while using a more authentic blogging platform to explore the other benefits on offer. For example, my friend Linda Yollis has been blogging with her students for over a decade and also enjoys using Seesaw in her third grade classroom. I love Seesaw! So easy to use…tons of creative applications, the activities are often very good and easy to use. The students love it and so do the parents. Seesaw is working fantastically in Linda’s classroom so obviously no one would suggest stopping that. 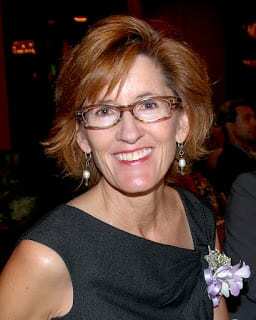 However, Linda also uses blogs to give her 8/9 year old students some priceless experiences. Her students are setting up their own blogs with a WordPress based platform (Edublogs). You can see the student blogs on the sidebar of Linda’s class blog. They’re learning about digital citizenship and what should/should not be published on a public platform. E.g. they’re coming up with their own pen names and avatars. 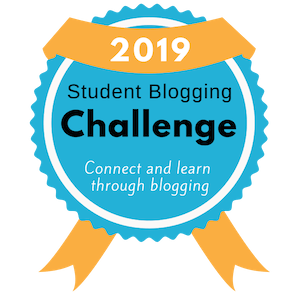 Linda’s students are currently taking part in the Student Blogging Challenge and connecting with students from around the world. Many students are getting creative with web tools and also integrating the work they’re doing on Seesaw into their blog posts. Students are enjoying working at their own pace. While some students consolidate the basics, others have really taken off and are learning about some advanced blogging features. A lot of peer tutoring is happening in the classroom as students share ideas and learn from each other. I think this is a great example of bringing together a closed and public platform to make the most of all the benefits on offer. I hope this visual comparison helps you process just some of the pros and cons we’ve discussed. 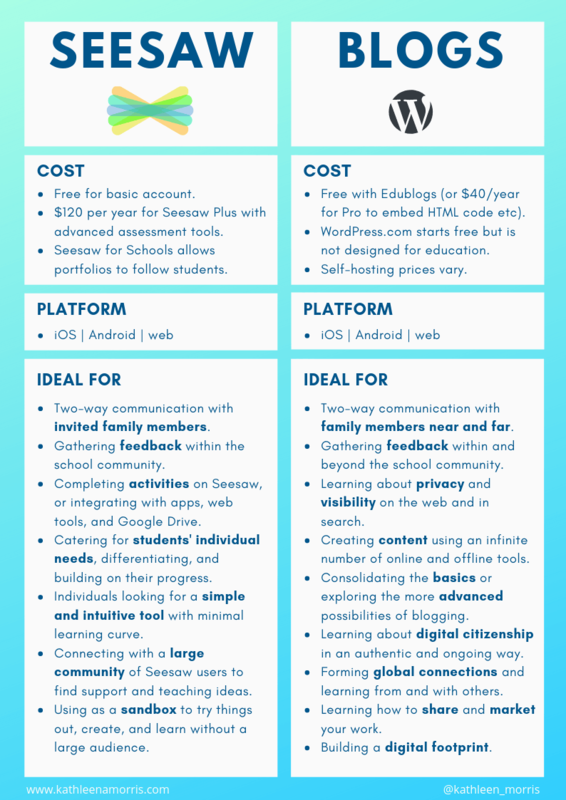 Seesaw has a huge number of benefits. It’s an entry point for introducing students and teachers to digital portfolios. It’s a winner in the eyes of most parents who like to keep up to date with what’s happening in the classroom. Using a tool like Seesaw, whatever age group you teach, has advantages and is better than doing nothing! I see Seesaw as a sandbox for learning and creating while sharing with parents in an ongoing and timely manner. Students need to learn that not everything they try or create needs a public audience (such as on a public blog). But they also need to realise the benefits of sharing with a public audience, building a digital footprint, and becoming a global citizen. These dilemmas can be discussed authentically in a classroom that embraces both a closed learning space (Seesaw or even password protected blog posts) and a public authentic space (a public blog). The teacher shouldn’t always be the one to decide on the audience either. It’s essential that students learn to make these sorts of decisions to help them become more aware and responsible digital citizens. After all, these sorts of dilemmas are (or will become) part of a student’s everyday life. They need to constantly evaluate whether their photo/comment/opinion/information should be shared publically (such as on social media) or should be reserved for more private channels (email, direct messaging, face-to-face etc.). It’s a complicated world we navigate these days! Introduce a tool like Seesaw into the classroom from the first year of school. Students can start to learn about sharing online, documenting learning in a variety of ways and so on. Progress on this understanding and teach certain skills explicitly, e.g. how to take a good photo, how to make an effective voice recording, how to give and receive feedback. If you want to go further and connect with others around the world, add a blog! By grade 2-4 start to introduce blogging into the classroom. Consider starting with a class blog. Students learn about making global connections and start to make decisions about what should be shared with a public audience. 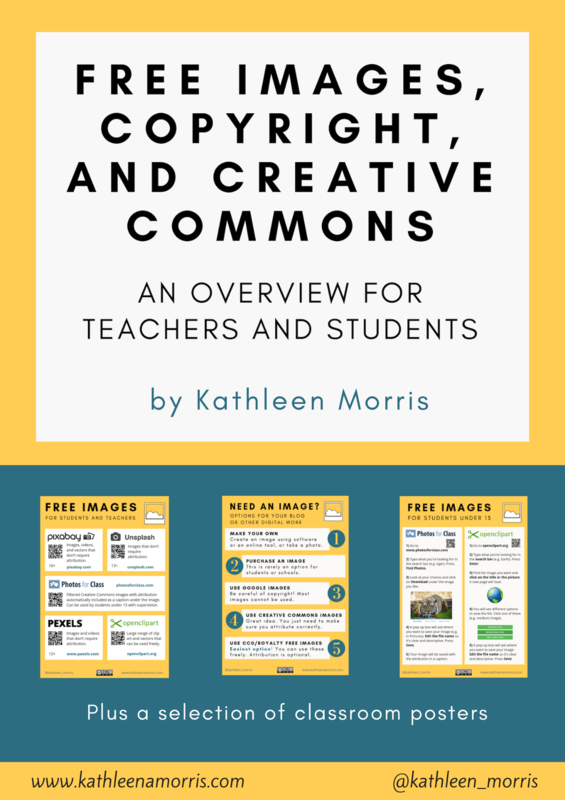 As teachers and students become more comfortable, students could have their own blog and continue developing their skills and portfolio. Ideally, the portfolio would follow the student from year to year. Ideally, this would be a school-wide approach. All too often I see teachers invest a lot of time teaching students to use digital tools really well and then it’s not continued the following year. What a wasted opportunity. I challenge you to consider whether you can do more for your students as they move into middle primary school and beyond. Let’s zoom out from the school environment and look at what’s important and worthwhile from a big picture perspective. Don’t underestimate the potential of your students. You might be amazed at what they can come up with when they’re presented with the blank canvas of authentic technology. Perhaps they can build an audience beyond their teacher and parents. Perhaps they can mix and remix their work to put their talents on show for the world. Perhaps they can stretch their learning to discover a world beyond the set curriculum. Perhaps they can skillfully navigate digital dilemmas in a supported environment that will prepare them for when they’re let loose on the web. I’d love you to share your thoughts in a comment. Can you share any pros and cons of any digital portfolio platforms? What have I missed? Can you build on this discussion further? Scroll down to find the comment box and I’ll reply to you ASAP. I’ve really enjoyed reading your post. I worked in a school with a great blogging program (class blogs and the introduction of student blogs in upper primary). I was really disappointed when a school wide policy decision based on privacy concerns meant that blogs were out and replaced with Seesaw. While I have used Seesaw and it has benefits as you have outlined it does not offer anything like the rich experience that blogging brought into the classroom. I miss the blogs and the amazing connections that were built student to student and classroom to classroom all over the world. I will keep advocating for blogs! Thanks for all the amazing work that you do. Thanks so much for commenting! I’m glad I’m not alone in my thinking on this topic. What a shame your blogging program was replaced by Seesaw. I have heard of this happening. As we both know, it may cause less headaches in the short term but in the long run it’s doing the students a disservice. Instead of being able to learn about digital citizenship in a supported way, using an authentic platform, they’ll be left to their own devices to figure it out. Definitely keep advocating for what you know is right for your students! Maybe you can find other little ways to bring global collaboration into the classroom. E.g. I love Skype sessions although it’s even better when the conversations can continue on a blog. I’m sure you’re doing an awesome job. I really enjoyed reading your comparisons between blogging and seesawing. 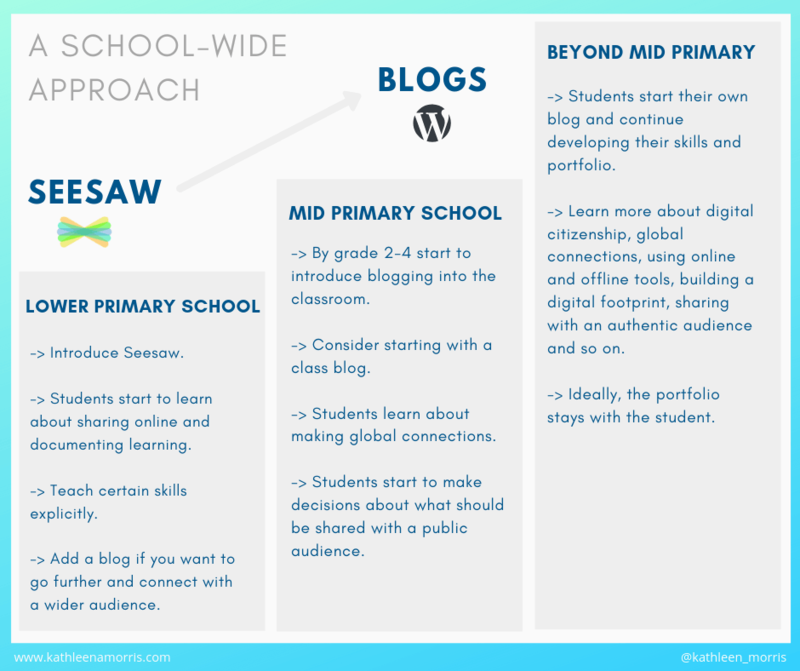 I have used both and have found that blogging was a great way to communicate and share work in primary but when I was placed in a kindergarten classroom I found that Seesaw was easier for younger students to share their work. Being able to use QR codes certainly makes it easy for the students to access. It is easy to upload videos, recording and work samples and parents are quick to post comments. 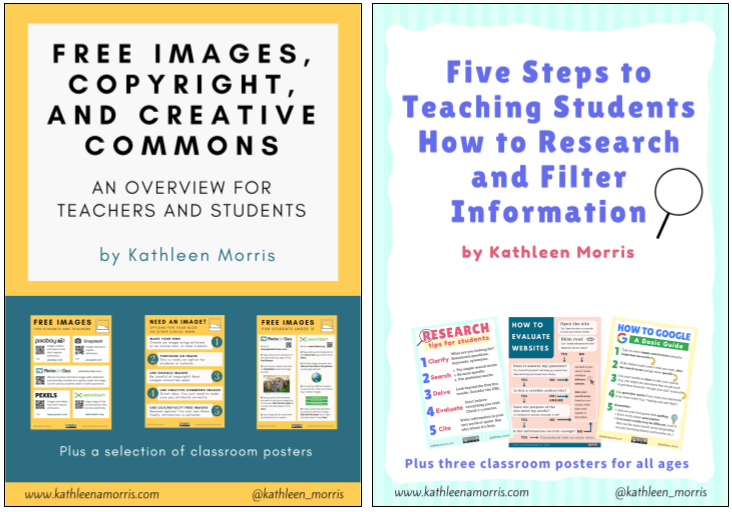 However, as you mentioned in your blog, at the end of the year parents loses access to all the work samples and photos that students have posted. I’m interested to hear what other kindergarten teachers have discovered. Many thanks for your generous sharing of ideas. Great to hear about your experience. I certainly agree that a simple tool like Seesaw that has minimal options and allows for QR code logging in would be a LOT easier to manage with kindergarten students! It can provide the students with some great experiences too. I bet they’re learning a lot. I didn’t realise until writing this article that student work couldn’t carry over unless you have Seesaw for Schools. I thought surely this would be an option for Seesaw Plus even. This is a downside for me. I wonder if all Seesaw users realise this when they start using it. Like you, I’d love to know what other students of younger classes have figured out! Thanks so much for taking the time to comment, Christine. I started using SEESAW AND EDUBLOGS with my 7th and 8th grade students this year. Thanks for your comments comparing these two platforms. Your comments will help me make better use of both platforms. I would agree with you that learning WordPress is much more of a “real-world” skill that students will have the ability to use beyond the classroom. Also creating for a public audience is very good practice for students, however, this is probably best for high school students and beyond. I’m a little nervous about parents not wanting their children’s blogs to be public. So far I haven’t got any pushback, but I just started with this blogging thing with students. One question: Are students able to make their edublogs their own by getting their own domain and then switching the blog from edublogs to wordpress.org ? Thanks for sharing your thoughts. I hope Seesaw and Edublogs are bringing the best of both worlds to your classroom, just like in Linda’s class. I know what you mean about push back from parents. I think the best approach if you want to have a public blog is to ensure you have guidelines in place from day one. That way, students (and families) know what they should and should not publish on the blog (things like surnames, school name, plans or whatever works for your community). Having guidelines around photos is also a good idea too. Like not matching a photo with a name. Hopefully with these guidelines in place and clear communication with parents about the benefits of blogging as a platform to learn about digital citizenship, you’ll find you have support. Great point about students making their blog their own. Last year, I interviewed a college student called Myles who started blogging in high school and then got his own domain and kept going with Edublogs. Alternatively, he could have exported the blog easily to WordPress.org. Thanks so much for chiming in, Caleb! Thank you Kathleen for breaking down the differences and similarities between Seesaw and Edublogs (and blogs). Reading your discussion of ‘dumping’ evidence verses crafting a presence, made me think of my own practice of collecting posts (such as this) versus crafting longer responses. Parental Engagement: Once set up, Seesaw is easy to engage with either via desktop or mobile. It often feels as if blogs involve more effort. Platform verses Process: I wonder if a focus on Seesaw versus Edublogs overlooks the question of process? I know you touch upon digital presence This was something I tried to grapple with recently in a presentation on using GSuite to support ongoing reporting. Transfer-ability: The one thing that I love about WordPress and Edublogs is that I can easily take my data and load it somewhere else. I am yet to work out what I would do with all the artefacts I collect in Seesaw. In the end I think that the biggest question that people need to consider is what is trying to be achieved and which tool will help this. I agree that Seesaw can often be easier for parents to engage with than blogs. Sometimes this is because the way blogs can be used by classrooms haphazardly? I do think that whatever form of parent communication you use, you need to be clear about how it’s being used and then stick with it. Good point about process and definitely something to think about further. This was the kind of post I had to write to help my clarify my thoughts. And I’m sure those thoughts will keep developing! Seesaw not being so export friendly is an issue. And I think a lot of teachers would jump in without considering this at all. Yes, it is about considering what you’re trying to achieve, for sure. All too often I see it happening the other way around! Great review of pros and cons on both platforms. Thanks Kathleen. Trying to not be too bias, as I am a Seesaw Ambassador. But having said that, I haven’t had the op to use it in a class situation for a couple of years. Shifted into RFF mode with Digital Tech full time. But back in 2017 I used it extensively with a Yr 5 class. I created a monthly “Learning Snapshot”. This was where I would take an assessment (rotated through mainly Literacy and Numeracy) and photoed kids results then sent off to individual parents. I would also do a pre and post photo shoot – ie; 1st wk of Term and then after a 3 to 4 week intensive – I would do a retest and show the parents. Warts and all!!! Yes – there was some work involved, but parents loved it. Anything that connects the parents to their child’s learning and increases engagement can only be a good thing. I definitely agree that anything that connects parents to their child’s learning is a good thing! So it’s certainly a case of figuring what will work best for you and your school community. Thanks for sharing your insights into how you used Seesaw. I’m always interested to learn about how people are using different platforms. I’m sure it will give other readers ideas too.